Below please find a copy of the front cover and back photo for the book, A CAT NAMED TOTO, 300 dpi. Please email catsong2@netzero.net with any questions. 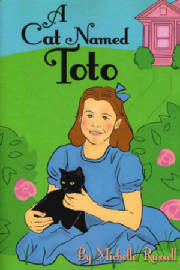 A CAT NAMED TOTO is the story of a little girl named Michelle and her beloved cat, Toto. Toto was named for Toto in The Wizerd of Oz. Michelle's mother adopted Toto for her from a local animal shelter. Soon, they are the best of friends. This 52 page book contains 14 lovely illustrations, by Liz Kezer. A Cat Named Toto is bound to be a favorite among children who love cats.